I’m thrilled to be hosting Thanksgiving this year! Without a doubt its my favorite holiday. Great food, family, friends and good drinks. What else is there to live for. It’s a time to give thanks for all that we are grateful for and all that we often take for granted. My daughter lost a grandma this year. She will be missed and in our thoughts this holiday season. Many of us have survived various degrees of Hurricane Sandy’s impact. I know those of us who spent extended time without electricity will be happy to light candles illuminating our Thanksgiving tables, because we want to, not because we have to. For some reason, the last month has caused the side of my brain that organizes stuff in my life to shut down. I’ve tried to fix it, but it’s not cooperating. I had high hopes of a beautiful photo of a big turkey on my homepage, obviously that didn’t happen. Thanksgiving doesn’t have to be weeks of preparation and days of cooking, leaving you exhausted and unable to enjoy the big day. Try to simplify things a little. There are many recipes that you can make ahead or that require little prep with delicious results. I just made these carrots from Food and Wine as a trial run for Thanksgiving and this dish is a keeper! Sweet and spicy from molasses and chipotles, I love how their flavor adds a nice kick to the Thanksgiving plate. 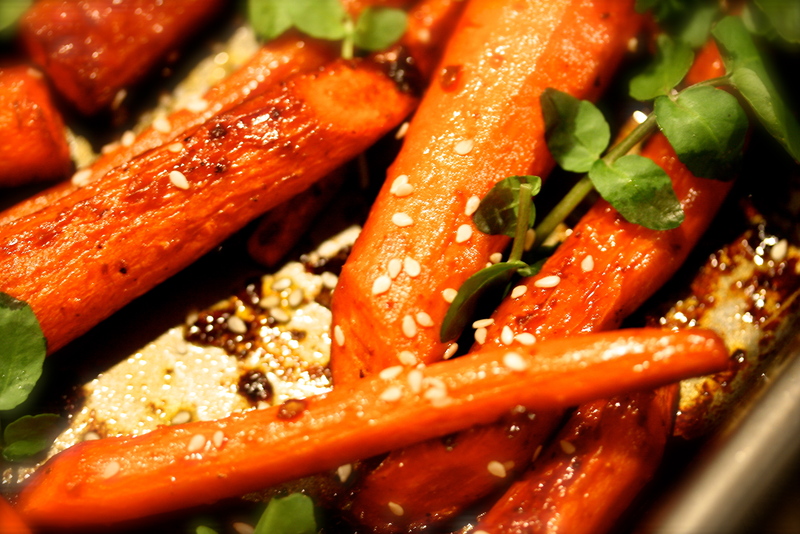 On a sheet pan toss the carrots with the minced chipotle, adobo sauce, molasses and olive oil. 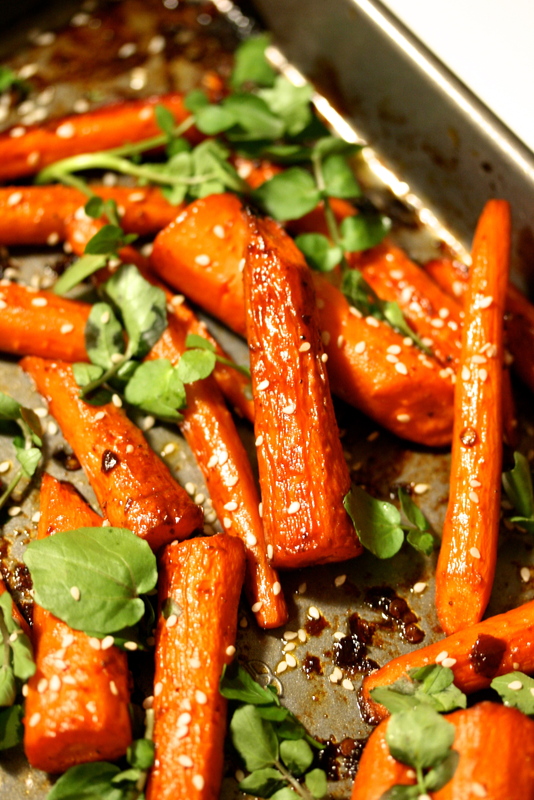 Spread the carrots out evenly on the pan and roast for about 35-40 minutes until tender. Timing will depend on how thick your carrots are. Check the thickest one on the pan, using a fork, after about 30 minutes. 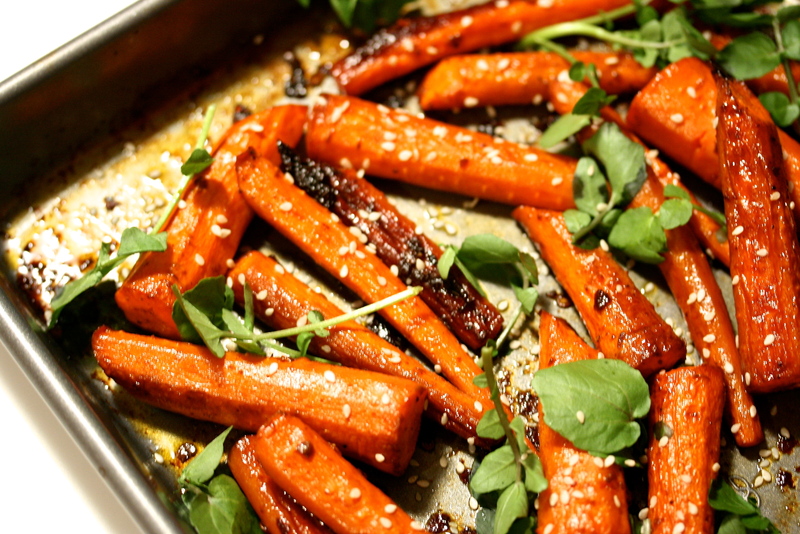 Remove the sheet pan from the oven and allow the carrots to cool slightly. Sprinkle with the sesame seeds and watercress leaves. Toss to combine and serve. NOTES: I’ve changed the original recipe to make it even simpler and to reduce the amount of olive oil just a little. The recipe calls for 30 thin baby carrots (2-3 bunches) with the tops discarded. These are the pretty carrots that remind me of Peter Rabbit. I know these can be hard to find, so I made this using a 2lb bag of carrots from the grocery store. It turned out perfect. In addition, this is spicy! I used only one chipotle. The original recipe calls for two. Feel free if you can take the heat. Serve it with some plain greek yogurt or sour cream if you want to cool it down.